Former Detroit Mayor Kwame Kilpatrick spent more than two hours on the stand today in a civil lawsuit filed by the family of slain dancer Tamara "Strawberry" Greene. He is accused of intentionally destroying e-mails that could shed light on the woman's unsolved killing. 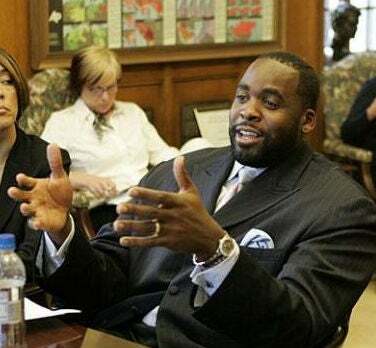 Former Detroit Mayor Kwame Kilpatrick discounted years of accusations that his administration scuttled the Tamara Greene investigation, saying he never talked about or had e-mail discussions about her murder. "Unequivocally, we never discussed Tamara Greene," Kilpatrick said. "You did a good job stretching it out this long," Kilpatrick told Greene family lawyer Norman Yatooma. Yatooma has pursued the case since 2005, claiming the former mayor and city obstructed an investigation into the woman's unsolved death. Kilpatrick also testified today he did not remember a federal judge ordering the city to preserve e-mails and other evidence in 2008 relating to the unsolved death of Greene, an exotic dancer. … At the conclusion of nearly two hours of questioning, Kilpatrick said, "I thought it (this lawsuit) was frivolous then and even more so now." Read more at the Detroit News. In other news: John Legend Promotes White House Competition to High School Kids.